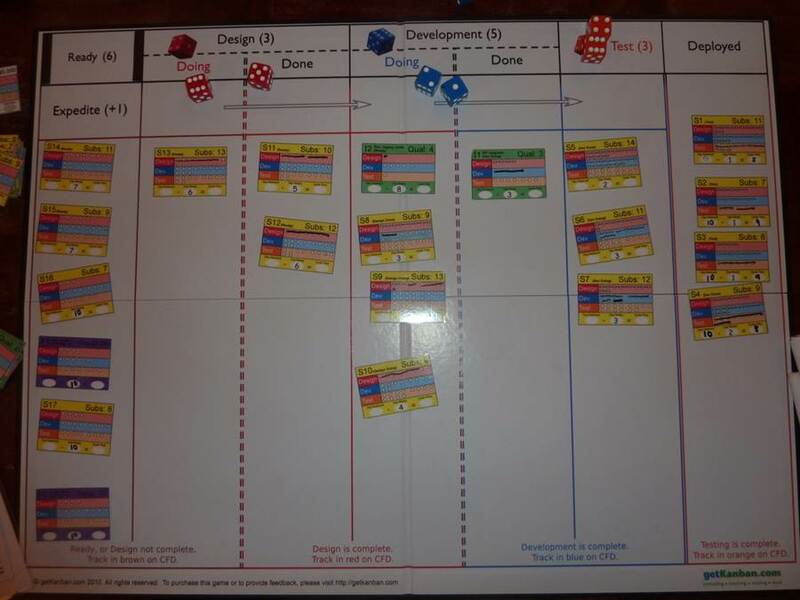 At Agilesparks we’ve recently been using the Kanban Board Game developed by Russell Heally (@getkanban) quite extensively. We use it as part of Kanban courses, sessions for Scrum teams that want to learn about Kanban, Kanban teams that are already working and want to raise their game, as well as in Kaizen sessions for project management teams. I’ve been reading some ideas from David Anderson and Russell about this, which helped me along. I’ll provide my take on this, but first a brief overview of the game to those not familiar with it. The game simulates a process workflow where there is a stack (backlog) of cards which represent stories for development. The cards are pulled into a READY area, then pulled into Analysis, Development, Testing and finally deployed. There are different types of cards representing different work types/classes of service – a normal business value card, a fixed date card, a quality card, and an expedite card. Each card specifies the amount of work required to process it in each station, which provides the variability between work items so typical of product development and other knowledge creation areas. Another form of variability is the fact that how much work you are able to do each day is decided by throwing dice. You have dice in different colors that represent specialists in each area (Analysts, Developers, Testers), and you as the team playing the board can decide where to use each dice each day. Either use it in the specialty area of that person and gain a multiplier, or use it elsewhere without a multiplier. The game is played in cycles of days – each day you decide your strategy, throw the dice, play the game, update visibility charts, and also handle an event that might throw you some additional curve balls… That should suffice as a quick intro to understand the rest of the post, or at least as a teaser to find the opportunity to play the game. It really is highly recommended to anyone interested in Agile / Kanban / Scrum / Games. Exceptional work by Russell. If you noticed so far, the game indeed simulates kanban. No time-boxes or batches, just flow and flow and flow. The only area where you get some sort of sprint behaviour is towards the end of the game. If you are approaching the end of the game and the teams know its coming, they will start to prefer cleaning the board and deploying items, rather than maintaining flow. That makes sense. If you announce end of the game on day 24 for example, but finish it a few days early without telling the teams, you will get flow behavior all the way to the end. You can play with that, depending what you want the teams to experience, and whether you want to have the timebox behavior as a pattern to discuss in the debriefing. But seriously, the main thing you need to take care of is the sprints. The concept of 3 day billing cycles in the game can be extended to portray a sprint. You would start the cycle with planning what cards you will work on in the cycle. This requires looking at your velocity in the last cycle, your capacity (cubes and statistics…) thinking about changes that were made in the environment (Carlos etc. ), and the cards that are currently in the backlog. You would commit to what cards you plan to deliver. Which gets us to the backlog… The trivial option is to make the READY area the backlog, and only pull into the READY area (into the board actually) cards that fit into the planning. This is not perfect though. For starters, how do we model the work that is done by the Product Owner? In addition, the whole flow from READY through analysis, development, testing might be a bit too long for a 3 day cycle. That brings me to an alternative I’ve been thinking about – make the Analysis phase the work of a “Product Owner”. Use the analyst dice to represent the Product Owner, and the “Analysis Done” area the “Sprint Ready” backlog the teams can use for their planning. A sprint will be 3 days where the team works to finish and deploy all the cards in the Sprint Backlog – processing them through Development and Testing. Within this sprint the team also needs to take care to replenish the “Sprint Candidate/Ready Backlog”, because remember at the end of the cycle, there is another Sprint Planning, where they will need to have enough candidate cards that they can pull into the Sprint Backlog, to avoid starvation in the sprint. To properly simulate a real Scrum environment, it shouldn’t be allowed to pull cards within a sprint, because it is harder to plan within a sprint. For advanced uses and for those Scrum people which are crying this is not fair, we can discuss a couple of options. One option is to allow pulling stories, while paying a fine for it to represent the cost of replanning. For example, you can put one of the dice on planning a story instead of executing it. Another option is to allow pulling quality cards during a sprint. In general btw, we need to think how to portray the cost of planning. In a typical stable Scrum team, there is a cost of about 2-3 hours of planning per a 10 day sprint. This is about 4% which should be negligible in the game. Another option is to just compare the time it takes to do rounds of flow versus timeboxed rounds in the game and see what is the actual time it takes to run the game… I would expect flow to run much faster than the time-boxed version… but need to try it! I’m hoping to try this on my own, probably with the AgileSparks team, sometime soon, and report. In the meantime, any comments or ideas are welcome. And again, thanks Russell for the great game, which probably deserves to be a platform, with endless options of what to do with it. If we could have this as a Lego kit that we can play around with, it would be amazing. This entry was posted in Games, kanban, Uncategorized and tagged Game, GetKanban, kanban, scrum on January 12, 2011 by Yuval Yeret.